Venue: Each month from January through October, KBF sets up Redfish Challenges in two divisions—Gulf and Atlantic—where five or more KBF Members may register and compete. Concurrent KBF Event: Redfish Challenges are conducted for both Atlantic and Gulf Divisions. KBF Members are permitted to compete in both, if they wish. Multiple Concurrent State Challenges: Competitors sign up to compete in one of both divisions if they wish, providing they have valid fishing licenses and/or comply with all regulations for each state in whose waters they fish. Prize winners must be prepared to submit proof of regulatory compliance. $10 goes to the KBF Redfish Challenge Championship prize pot, which is distributed as cash prizes in that October event. The remaining $30 of Entry Fee is distributed as cash prizes by rank. In each Challenge, from $25 to $50 is awarded as the Challenge Big Bass Prize. Digital photos for any KBF State Challenge may be submitted only for redfish caught from public-access waters for which the competitor is legally authorized to fish, and for which he complies with all regulations. Atlantic Division starts at Key West, includes all water east of the Florida Keys highway and runs up the eastern seaboard of the US to and including Delaware and Maryland. Gulf Division waters are from Key West and the Florida Keys highway west, up the west coast of Florida, around the Gulf states to the southern tip of Texas. Event Schedule — All times below are Eastern time zone for the Atlantic Division and Central Time Zone for the Gulf division. Scores and Ranking: Event ranking is determined by the total score (length, adjusted by penalties for infractions, if applicable) for up to three photos that remain beside Competitor’s name on the NRS Leader Board after Event judging and verification is complete. 10% of field pays out, with numbers of places and amounts varying with number of registrants. Open KBF Redfish Challenge Series Payout Chart. Sponsor Awards: To first place in each division, NINES Optics is awarding a Gift Certificate valued up to $160, redeemable for one pair of NINES sunglasses at FishUSA. Mystery Fish Competition: Using a “Mystery Fish” length generated at random each month, a $25 KBF Gift Certificate will be awarded to the competitor in each KBF Redfish Challenge Division who has a redfish of, or closest to, the mystery fish length by his name on the NRS Leader Board at end-of-competition. Ties are broken by earliest photo upload. 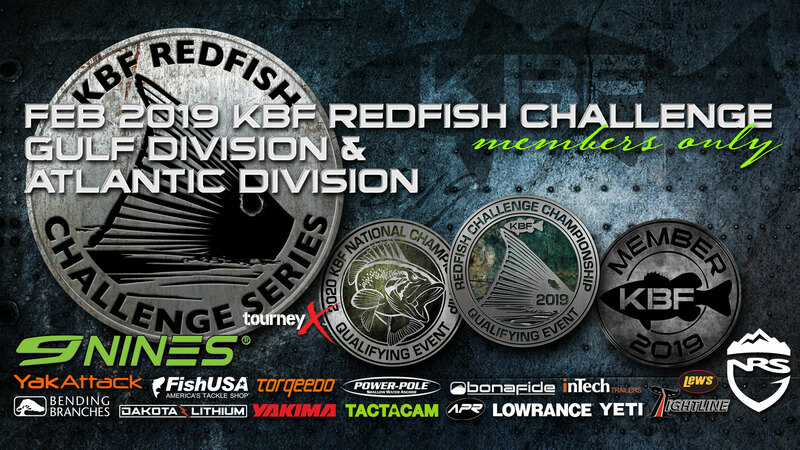 2019 KBF Redfish Challenge Championship Qualification: Top 10% (minimum top 10 at each Challenge) qualify to compete in the November/December 2019 KBF Redfish Challenge Championship. If already qualified, this award does not roll down. In addition, all who finish in the top 100 by national KBF Redfish Challenge Points ranking—many of whom will have already qualified—will also be eligible to compete in the 2019 KBF Redfish Challenge Series Championship. Reward Distributions: a 24-hour Dispute Period commences when Event judging and review are complete and the Tournament Director announces preliminary results. When all disputes have been resolved, no sooner than 24 hours later, prizes, Challenge Points and KBFNC and Challenge Championship qualifications are finalized and posted on this page. Cash prizes are then distributed via PayPal Funds Transfer using the email address provided by Competitor during event registration. If KBF requires that a Competitor provide an IRS FORM W-9, prize distribution to that Competitor will occur after the completed, signed and dated form is received.